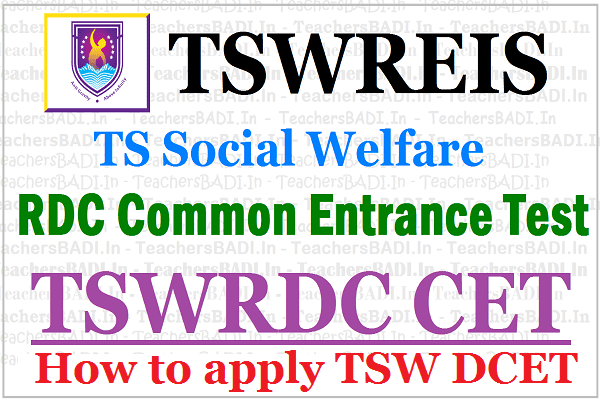 How to apply for TSW DCET 2019/Tswrdc cet/TSWRDC Entrance test 2019, Apply online for Tswreis rdc cet 2019 @ http://tswreisdc.cgg.gov.in/, How to fill the Online application form of ts social welfare rdc cet 2019: Telangana Social Welfare Residential Educational Institutions Society(TSWREIS) has issued the TSWRDC Common Entrance Test (TSWRDC CET) 2019-2020 Notification in April 2019-2020 and the TSWREIS invites online applications from the eligible Women (Unmarried) candidates from Telangana State for admission into Degree first year courses in its TS Social Weflare Resindetial Degree Colleges for the academic year 2019-2020. Notification for Entrance Test for seeking Admission in to 1st Year Degree Semester wise Course for the Academic Year 2019-2020. Online applications are invited only from women (unmarried) candidates for TSWDCET-2019 (entrance test to be conducted in both English and Telugu media) for admission into 1st year B.A/B.Com/B.Sc Degree English Medium Courses (40 students in each course) in TSW Residential Degree Colleges for Women for the Academic Year 2019-2020. PAYMENT GATEWAY centres from ....-04-2019 to ...-05-2019 to enable option to submit the application through online. with submission of application through online by logging on to thewebsite tswreis.cgg.gov.in. 5. Issue of journal number does not mean that the candidate has completed submission of application online. It is only a confirmation for the fee received. 7. The candidate shall follow the procedure for submission of online application as given in the “Information Bulletin” and also as per the instructions provided online while filling up the online application form. 8. The candidate should be ready with passport size photograph (3.5 X 4.5 cms) before filling up the online application. 9. The photo should be scanned and uploaded along with the application form. 10. While filling up the online application, the candidate has to opt the test code for which she wants to appear for the TSWDCET- 2019 (i.e Test1-EMPC/Test2-EBPC/Test3-EMAC/Test4- ECEC/Test5-EHEC). 11. On submission of application online, the candidate has to take a copy (print) of the application form in which a reference number also will be given. This reference is required to download the Hall Ticket. The copy of online application is to be preserved for further reference. The candidate is solely held responsible for any mistakes / incorrect information given by her. Hence they must take utmost care while filling the online application. 12. The applications of the ineligible candidates will be rejected. 13. The candidate should be able to produce the original certificates at the time of counselling for admission as a proof to the information furnished in the application. 1. Candidates can download their Hall Tickets from the website at tswreis.cgg.gov.in from one week before of Entrance test with the reference number allotted to them. 9 Percentage of Marks secured in Intermediate. 14 Annual Income of the Parent – Rs.